Taking the human body to the next level using real science and independently researched ingredients. 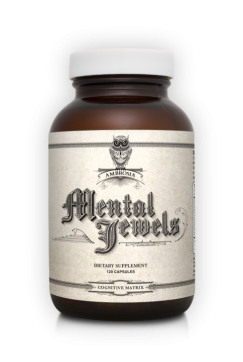 A main ingredient in Mental Jewels™ is AlphaSize® the highest quality and most proven form of Alpha GPC (Alpha Glycerylphosphorylcholine). Alpha GPC is known to be the most effective source of the very important micronutrient, Choline, which has been shown to contribute to learning and memory by increasing the Acetylcholine neurotransmitter. While we can obtain some choline in our normal diets, studies have shown that 90% of Americans are deficient in this crucial nutrient. As the most abundant neurotransmitter in the brain, Choline plays a key role in every cognitive function; and thus less than optimal levels can lead to a decline in mental acuity. AlphaSize® is the best and most efficient source for Choline Supplementation. In a 6 month clinical trail, participant consistently showed cognitive improvement two hours after taking Mental Jewels. We do this because of passion. We have a passion for unlocking the absolute limits of the human body; and we fully believe we can produce breakthrough natural products that allow us to get more out of our minds and bodies than we ever previously thought possible. Ambrosia Nutraceuticals was formed to take the human body to the next level using real science and independently researched ingredients. This is not your normal supplementation, but an approach to unlocking the most out of your potential. Proprietary Bacognize® Extract is a natural standardized formula derived from Bacopa monnieri known to promote cognitive function. Backed by thousands of years of traditional use, Bacopa monnieri, has been used in Ayurveda for a multitude of purposes, such as its Nootropic effects promoting cognitive health. Clinical research indicates that Bacognize® may offer a broad array of benefits for cognitive health linked to three major neuro protective mechanisms; including neurotransmitter receptor (serotonin) binding activity and antioxidant capacity. Bacopa is commonly used as an adaptogen supporting cognitive enhancement, memory, focus, attention, mood, emotional health, and stress. SerinAid® PhosphatidylSerine (PS) can play a critical role in both maintaining and improving mental performance - name and face recognition, recalling locations of misplaced objects, concentration, and focus - which is often an unfortunate component of the normal aging process. A multitude of scientific studies have shown that SerinAid® PS can significantly help maintain and improve mental performance, can help improve mood, and can make a valuable contribution to lowering both physical and psychological stress. To demonstrate just how effective PS really is, the US Food and Drug Administration (FDA), in February, 2003, granted two significant health claims for PS, indicating that PS may reduce the risk of cognitive dysfunction and dementia in the elderly. As an active ingredient, SerinAid® PS is ideally suited for use in dietary supplements, functional foods, and medical foods. NeuroFactor™ is an all-natural, patented product made from the whole fruit (including the bean) of the coffee plant, Coffea arabica. Traditionally, the coffee bean has been extracted for roasting and the surrounding fruit discarded. Everything changed when FutureCeuticals discovered how to preserve the whole coffee fruit for the benefit of human nutrition. Through years of careful clinical research, FutureCeuticals scientists discovered that ingesting small amounts of whole coffee fruit concentrate significantly increases BDNF levels in humans. Green coffee bean does not work. Chlorogenic acids do not work. Drinking coffee does not work. It is only the whole coffee fruit that goes beyond the bean and delivers support for naturally declining neuroprotein levels in humans. Simply, NeuroFactor™ is natural and clinically-researched support for brain health. Other Ingredients: Cellulose, Silicon Dioxide, Magnesium Stearate, Stearic Acid and Talc.